After arriving at Princesa Yaiza, you immediately experience a feeling of luxury and calmness you might not usually expect from a Lanzarote resort. It was late evening and we were greeted by a member of the management team with refreshing glasses of ‘Champagne’ or should we say a nice Spanish sparkling wine! Nonetheless it did the trick and immediately put us into vacation / holiday territory. Our 4hr flight from Scotland with Jet2 holidays had been great, but for breaks like this it’s not till you arrive does your holiday begin. Check-in was seamless and pleasant, although some air conditioning in the main reception area would have been nice; something we became quite aware of throughout our stay. Maybe one for the hotel to look into – although we do appreciate the environmental argument. Our email to guest relations prior to arrival also seemed to have been on their radar and we were assured we would be pleased with our room. We are not keen on rooms on the ground floor and much prefer sun in the afternoon and evening. We also like to be in a quiet area of any resort – so only three challenges for the reservations team to deal with. A nice touch was when the receptionist was able to show us a view from our room on their booking system; we’d never seen this before, but a great idea. We’re always a little apprehensive when we first try a resort; room location can really make or break a trip. We walked through a tropical paradise of palm trees and running streams and then along an open, airy walkway to our room on the second floor. Our Double Superior room with Sea View was large and spacious with a large sitting area and to be honest was what we had expected, the dressing room though was a pleasant bonus. It was to a high standard, with rustic wooden furniture and ‘interesting’ wall art. The bathroom had everything you needed and a quick check on the shower pressure assured us that all was in order and that we could make full use of the excellent range of toiletries provided. The balcony was much larger though and had two wicker sun chairs, but the question of whether it received the sun in the afternoon was still unanswered. A quick check on an iPhone app gave us some confidence things should be ok, but we weren’t sure – all would be revealed in the morning! The night time balcony view was special with large palm trees and the pool lit up pretty spectacularly. A saxophonist was also playing nearby; mmmm, what was that they said about a quiet area of the resort! A quick unpack meant we were able to venture out to our favourite cocktail bar Vino Blanco at the Rubicon Marina a 12 minute walk from the hotel. Nothing had really changed since our last visit, except a new addition to the menu. Restaurants that display pictures of the food on their menu board is a ‘no no’ for us and unfortunately these had arrived at Vino Blanco. Pleased to say though that the cocktails, atmosphere and views of the marina were great and we would certainly recommend a visit or two if you can. We did find out later though that the food in the pictures was still actually rather good, but please Vino Blanco ditch those pictures as they don’t do your food or establishment any justice. We headed back to our room around 11pm; a late one for us, and finally managed to get to sleep with an air of anticipation over what the morning would bring. Pleased to say that the saxophonist had also gone to bed and he and his entertainment colleagues did so each night around 10pm for the remainder of our stay. The choc on the bed and the vanilla aromatherapy meant we were sleeping in minutes. The following night after a review of the ‘pillow menu’ was even better. The view from our balcony in the morning was excellent, looking over greenery and a stunning salt water pool. We were in block C and almost everyone in block A opposite was basking in the morning sun, having coffee on their balconies. Not us though, we were already looking to forward to the afternoon and early evening sun with a few glasses of sparkling wine in hand. Although not top floor, we weren’t ground either; the reservations team had done a pretty good job for us this time round, so top marks for them. Our first breakfast at the Yaiza was what you would expect from a 5* star hotel buffet restaurant with the usual dishes on offer for you to browse, walk a few miles before choosing a little of every dish you fancied followed up with several visits to fill up on juice in the tiny glasses. Seriously though, the surroundings were great and service excellent and was a more than acceptable place to start the day. We do like something different though, something more relaxing and less strenuous!? More importantly we like to spend time with each other at breakfast as opposed to passing each other with a plateful of chocolate crepes and donuts. So the next day and for the rest of our stay, we decided to ‘dine’ at breakfast in the gourmet Isle de Lobos restaurant. The restaurant terrace is elevated and nestled in lush greenery with stunning views of Fuerteventura and Playa Dorada beach. The food is to die for, with rich Lavazza coffee on tap and for the more adventurous some Spanish ‘cava’ champagne. Lounge room music plays gently in the background whisking you away to another place. The menu is vast and rich, and to help you decide what you would like they bring you a platter of fresh bakery to give you energy during your decision making thought process. Importantly though in all of this you can still try the chocolate crepes at the end of your morning; just with a little more style and elegance. 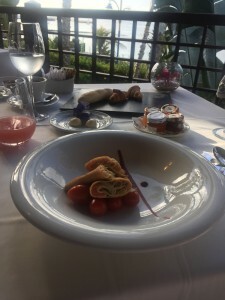 The gourmet Isle de Lobos restaurant is what holidays are all about and although you pay a little more for this breakfast experience it really is worthwhile and makes your trip much more special and romantic. We also ate in the Isle de Lobos restaurant once in the evening and again would recommend it to anyone; it certainly deserves its gourmet accolade. We enjoyed our balcony so much we continued with the sparkling wine theme (with some gin for extra measure) and had 3 nights on it ordering in room service, listening to the live singer and saxophonist in the hotels courtyard. Very romantic and relaxing; just what we both needed. For the remaining nights stay we ventured out to nearby restaurants. All were great with the usual type of food on offer. 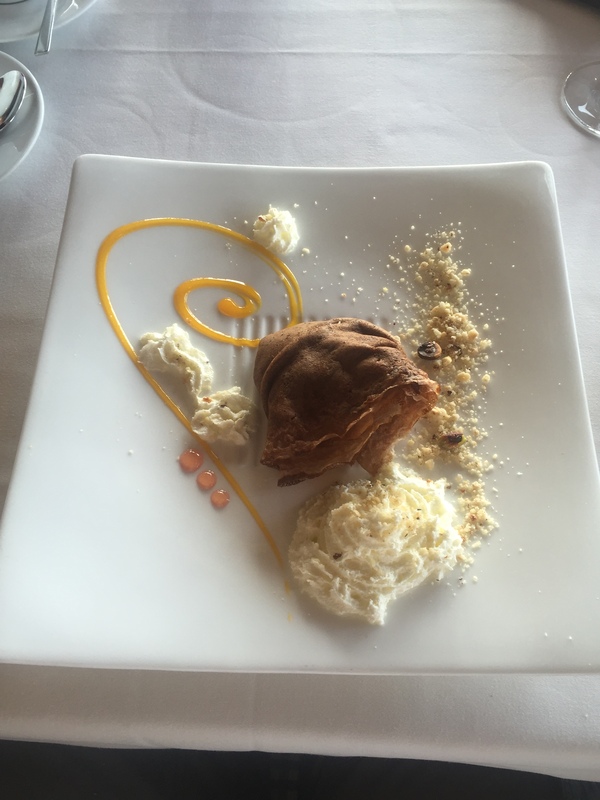 However, one restaurant in particular was simple outstanding – La Cocina de Colacho. So much so, we’ll be doing a separate blog / review on this in the coming days. Have to say that Princesa Yaiza also featured other stunning restaurants and menus to choose from and these will be on our radar next time. The gourmet Isla de Lobos is joined by the Japanese Kampai and the Italian Don Giovanni. There is also the more down to earth El Chiringuito restaurant and snack bar and the Bodega Tapas. The only reason we didn’t try these was that we needed a bit of a walk to work of those Crepes; why oh why do they put scales in your hotel room? Our holidays at this time of year are pretty relaxing and with the exception of a few mid afternoon walks for lunch into the Rubicon Marina we spent most of our day time lying by the pool or on our balcony in the afternoon. We also spent time in the Thalasso Spa on a few occasions, enjoying the hydrotherapy jets, tea room, sauna and Turkish baths. A truly relaxing and calming experience and worth a try. It wasn’t all relaxation, we did have one energetic excursion over two days exploring the area on mountain bikes – well we had to do something to work off those chocolate crepes. Hotel reception was able to organize the bikes for us very quickly and a company brought them at a specified time. The trip was definitely worth it as we caught sunrise at Papagayo Beach; just the two of us. Wow. We really couldn’t complain about anything at the resort although there was the usual issue with European hotels with some sunbeds being ‘reserved’ early on. Not a major problem getting one as there are plenty however the hotel should try and space them out a little as it did get cramped on occasion in some areas. The Princesa Yaiza is fantastic and our kind of place; it’s now definitely on our radar for further visits and is more than likely our accommodation of choice when we visit this area again; we can highly recommend a stay here. That’s our first travel blog completed. Hope you enjoyed it and we promise it will get better! Feel free to follow us on twitter or get in touch by email.